When Chinese President Xi Jinping failed to mention the word 'deleveraging' in his long-awaited new economic blueprint in December it was clear that the political tug of war between the advocates of 'reform' and 'growth' had been won by the latter. In the short-run, growth, as defined by changes in gross domestic product (GDP), can be increased by more lending and investing. In the longer-term, however, lending and investing can’t boost GDP if it results in bad debt that is properly written down. The big question is how much bad debt China currently has, and how much more it will be producing in the years ahead. By some estimates, China’s real growth rate, accounting for bad debt, is roughly half the official one of about 6.9 percent. To gauge whether China has been creating good debt - debt that will produce positive returns - or bad, we’ve examined who the beneficiaries of corporate lending are. As shown in the left-hand figure above, profits at private-sector enterprises rose 18 percent between 2011 and 2016, while profits at state-owned enterprises (SOEs) plunged by 33 percent. 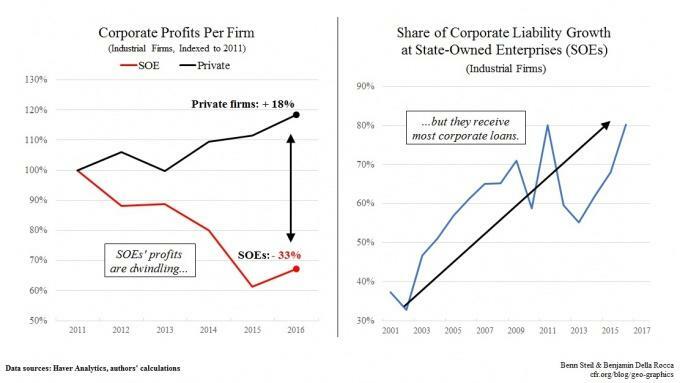 As shown in the right-hand figure, however, the share of corporate liability growth accounted for by SOEs soared from 59 percent in 2010 to 80 percent by 2016. This is the opposite of what one would expect in a market economy. As we highlighted last year, China’s non-performing loans (NPLs) have been growing. Given the evidence that Xi has abandoned any pretense of concern with NPLs, and our evidence that China is shoveling new loans to companies with the least ability to pay them back, we think China is heading towards a debt crisis.